Do you want to study in one of the top universities in Australia? Do you have an offer letter from RMIT and need help with what comes next? 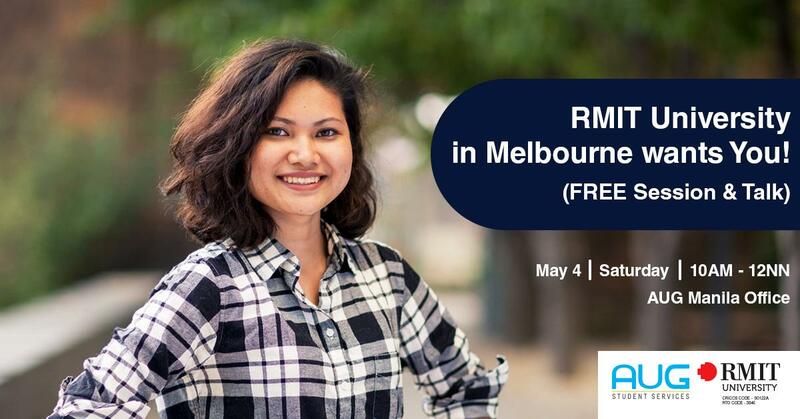 Attend this FREE Session with RMIT University! Come and meet RMIT University representative, Ms. Jane Cooper, at AUG Student Services, Manila, on Saturday, May 4, at 10AM – 12NN. Jane will be dialling in “live” from RMIT City Campus in Melbourne to discuss all things RMIT and answer your questions! RMIT is a global university of technology, design and enterprise, offering a range of foundation, diploma, undergraduate and postgraduate programs to more than 82,000 students. RMIT’s international reputation with employers, industry based learning, state-of-the-art facilities, and student support are just some of the reasons why over 11,000 international students choose RMIT, one of the best and top university in Melbourne. 1. Royal Melbourne Institute of Technology (RMIT) is located in Melbourne, one of the most liveable cities in the world. 2. RMIT offers a range of scholarships to current international students across all fields of study. Scholarships include financial support for students from diverse backgrounds, rewards for academic excellence and full scholarships for research students. 3. RMIT’s faculty and staff will help you attain your finest education. You’ll learn from internationally recognised experts and professors at the forefront of their fields. Many are established industry leaders, research innovators and they are engaged specialists in their fields. 4. RMIT enjoys an international reputation for excellence in practical education and outcome-oriented research, preparing graduates for success in a rapidly changing world. RMIT currently holds notable achievements and prestige on the QS World University Rankings.